2. Open the downloaded file slackex-14.2-64bit-kde-nvidia-efi-1620mb-171223.zip (with 7-Zip or...). You will see that there is one folder called slackex. 3. Extract the aforementioned folder slackex to the root of the USB stick. 4. Open up a command prompt as administrator (very important!) and make sure you are in F: (or the name your USB stick got on your computer). 5. 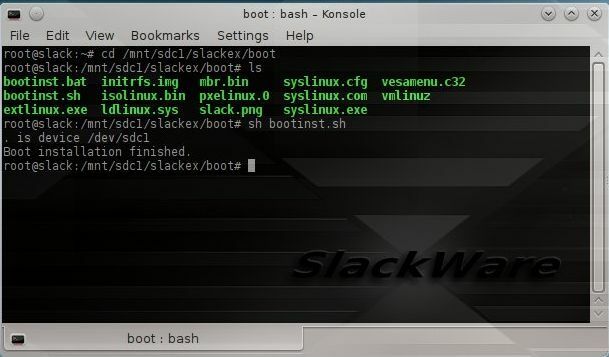 Run the command cd slackex/boot followed by bootinst.bat. This is because the USB stick must be made bootable. Important: Do not run the command when you are in the C:. (If you do then, Windows 10 - or whatever you have in your C drive - cannot be started). If you get error messages when running the command bootinst.bat, you should not worry about them. Just click a few times on "Retry". If you still get an error message saying that the operation has failed, do not worry about that either. The USB stick is bootable if you followed the steps in paragraph 1-5 above. 6. Set the BIOS so your computer primarily will boot from USB HDD (or similar). 7. Restart the computer with the USB stick in place. (See also additional info on this page below). This is how it looks when I run the aforementioned commands. NOTE: It appears that not all USB sticks are suitable for topical purposes. I. e. they can not be made bootable. I myself have experience of brands Kingston DataTraveler 3.0, SanDisk Cruzer Micro, SanDisk Extreme USB 3.0 and Sony Micro Vault. The first three works (for me). You may not use USB sticks of older model. They may work, but mostly bad. If you - after the installation of SlackEX to the USB stick - get different error messages when you try to run the system from the stick it is because the stick is not "good enough". NOTE: All system changes are PERSISTENT.